Very well presented inventory status – see the list of all products, track weekly sales and compare those numbers to inventory on hand, sale orders and how many units of each product are still available; set up a reorder point for each item and once you run this report, it will mark all products that need to be reordered. Create bill of materials (BOM) – the software lets you design BOMs for different products you manufacture combining all that goes into putting together a product: labor, utilities, raw materials, inventory parts, or outside services. Get a good idea which products make it and which ones break it for you – Profitability by Product report compares actual revenues to actual costs of each item and calculates profitability; this is very helpful in deciding on sales promotions or which products should receive greater attention of sales personnel. Sales by Product report lists all the goods you sell, displays dollar amount of each product sold up to specific date (that can be modified), and assigns percentage of total sales that each product is responsible for; this is the easiest way to see which product is important in keeping you in business; this report put together with Profitability by Product can prove invaluable in deciding on future plans for your organization. Open Sales Orders ensure that no customer is left unattended waiting for their products. Create different unit volumes for the same product – whether someone buys a pack or a case the software automatically calculates and displays the amount ordered on the invoice and adjusts inventory adequately. What else to expect? 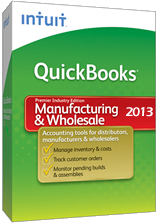 For once QuickBooks Manufacturing and Wholesale 2013 is very intuitive and the learning curve is not very steep. Overwhelming at first may be the number of features it offers, but at its basic level it will carry out the most important operations. It is easy to add, eliminate, and change products, customers, or vendors. It comes with some templates for estimates and invoices that can be later modified. The same applies to purchase orders that are connected to receiving products and invoices. Select bill payment section to see when the invoices are due, pick a bill, and print. Equally easy is receipt of payments either as deposits, checks, or credit cards. Besides some reports that mentioned earlier, you can analyze all aspects of you company performance from balance sheet to income statement to cash flow. Other reports are related to sales by item or vendor and can be exported to Excel to study their fluctuation over time.